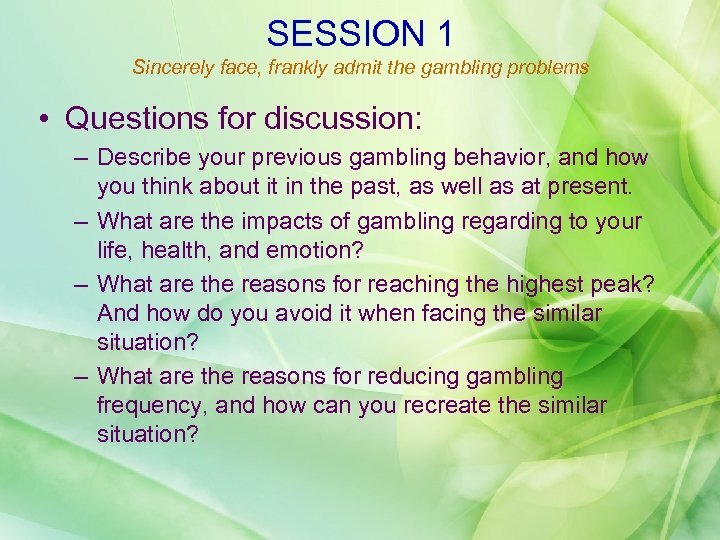 SESSION 1 Sincerely face, frankly admit the gambling problems • Questions for discussion: – Describe your previous gambling behavior, and how you think about it in the past, as well as at present. 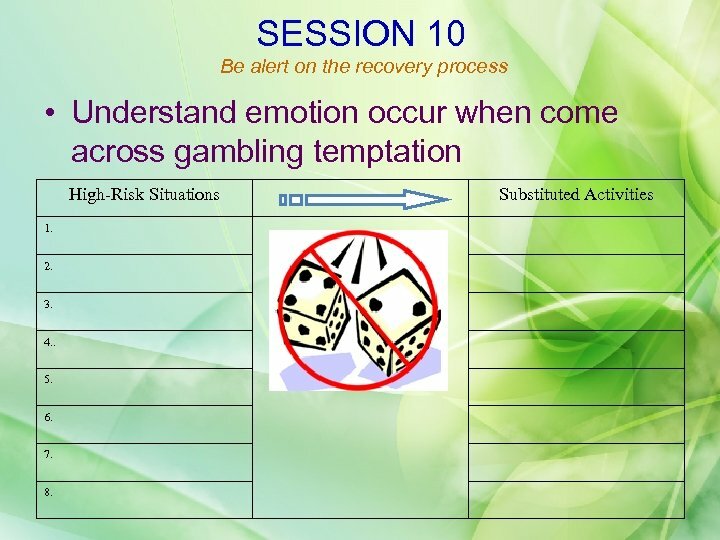 – What are the impacts of gambling regarding to your life, health, and emotion? – What are the reasons for reaching the highest peak? And how do you avoid it when facing the similar situation? 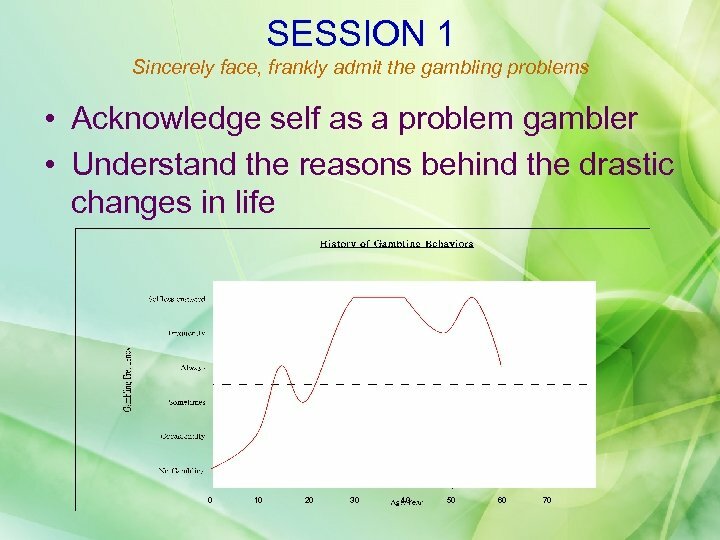 – What are the reasons for reducing gambling frequency, and how can you recreate the similar situation? 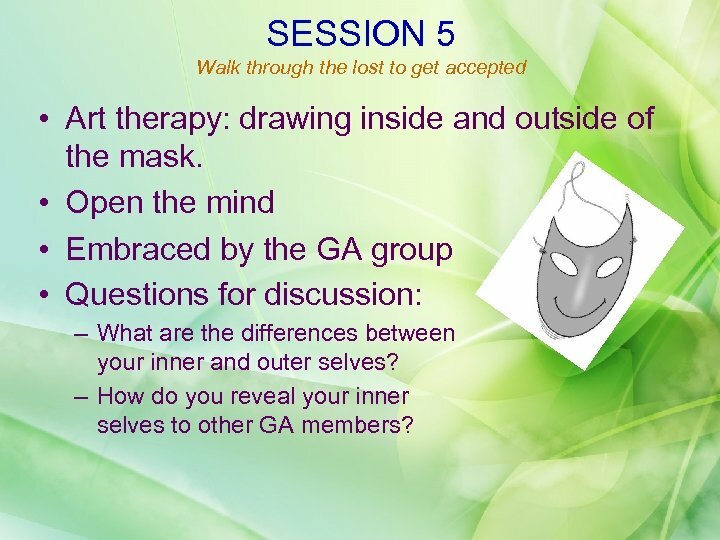 SESSION 5 Walk through the lost to get accepted • Art therapy: drawing inside and outside of the mask. 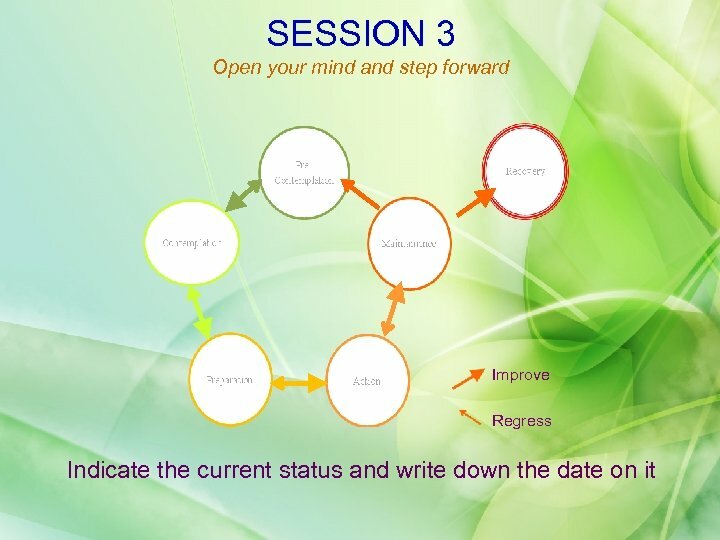 • Open the mind • Embraced by the GA group • Questions for discussion: – What are the differences between your inner and outer selves? – How do you reveal your inner selves to other GA members? 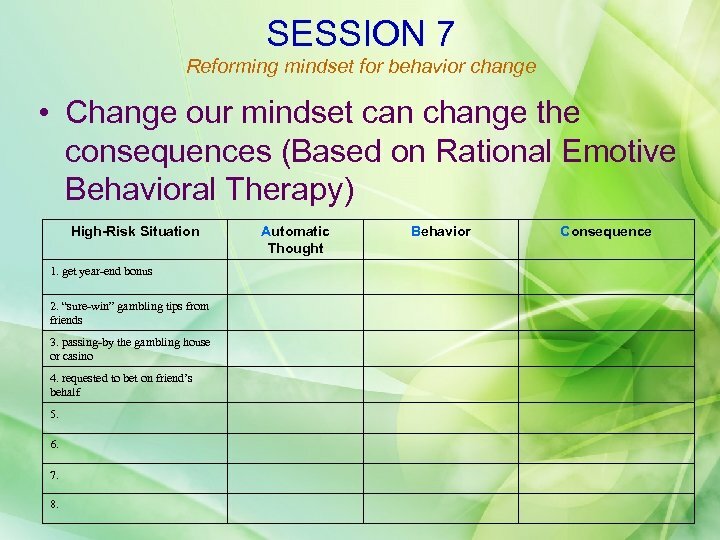 SESSION 7 Reforming mindset for behavior change • Change our mindset can change the consequences (Based on Rational Emotive Behavioral Therapy) High-Risk Situation Automatic Thought Behavior Consequence 1. get year-end bonus 2. 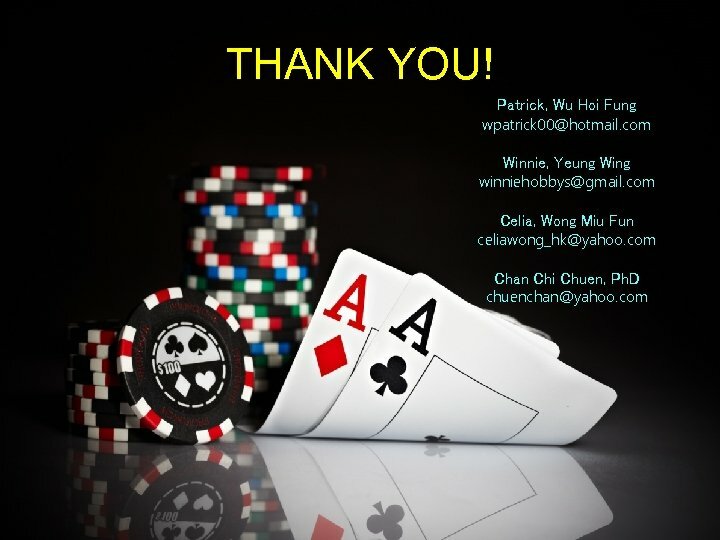 “sure-win” gambling tips from friends 3. passing-by the gambling house or casino 4. requested to bet on friend’s behalf 5. 6. 7. 8. 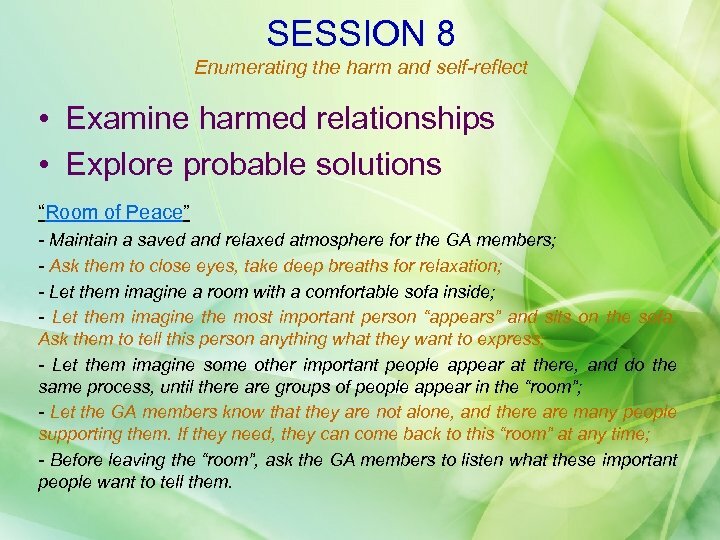 SESSION 8 Enumerating the harm and self-reflect • Examine harmed relationships • Explore probable solutions “Room of Peace” - Maintain a saved and relaxed atmosphere for the GA members; - Ask them to close eyes, take deep breaths for relaxation; - Let them imagine a room with a comfortable sofa inside; - Let them imagine the most important person “appears” and sits on the sofa. 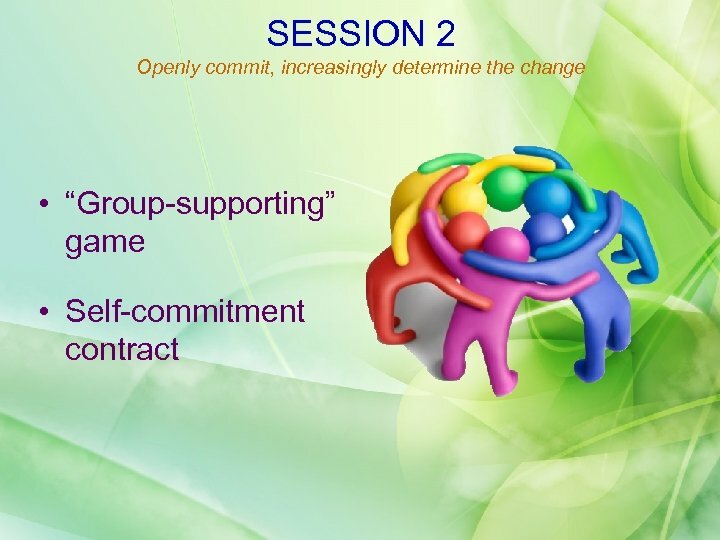 Ask them to tell this person anything what they want to express; - Let them imagine some other important people appear at there, and do the same process, until there are groups of people appear in the “room”; - Let the GA members know that they are not alone, and there are many people supporting them. 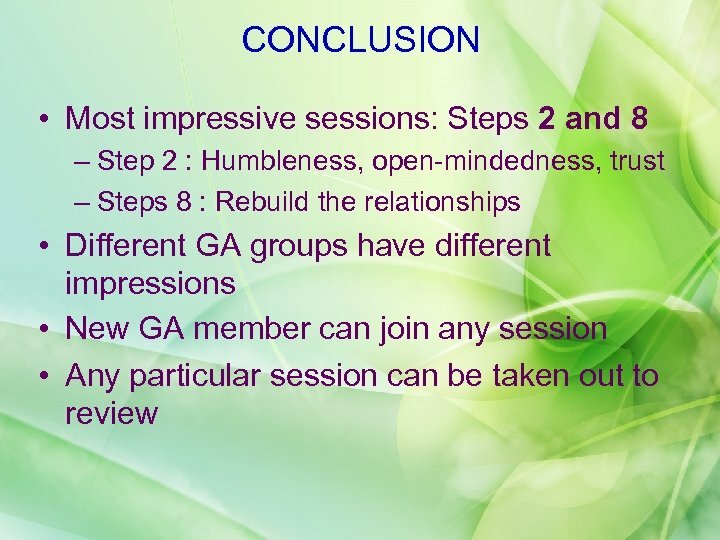 If they need, they can come back to this “room” at any time; - Before leaving the “room”, ask the GA members to listen what these important people want to tell them. 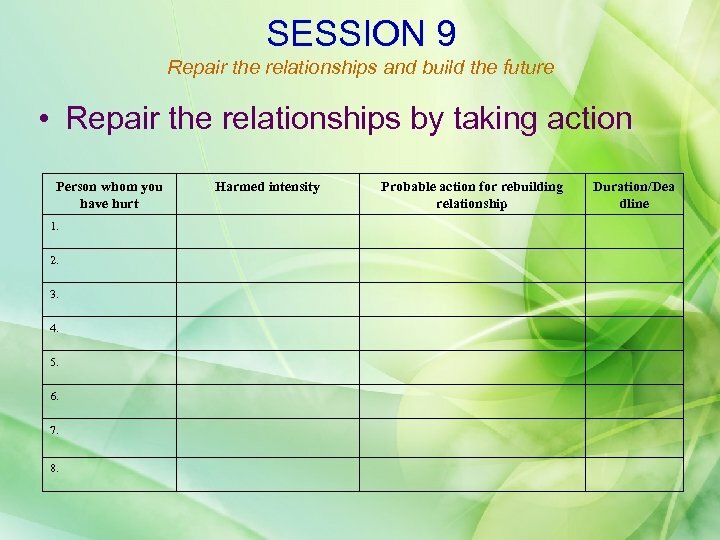 SESSION 8 Enumerating the harm and self-reflect Person whom you have hurt Harmful actions on him/her Relationship rebuilding plan 1. 2. 3. 4. 5. 6. 7. 8. 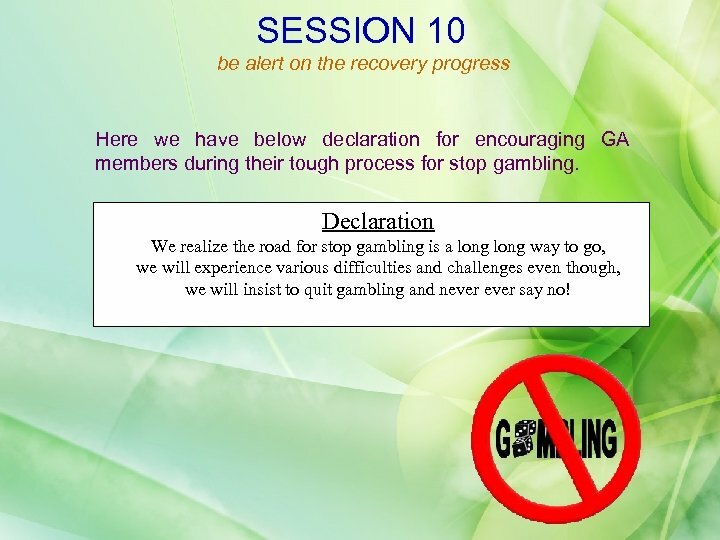 SESSION 10 be alert on the recovery progress Here we have below declaration for encouraging GA members during their tough process for stop gambling. 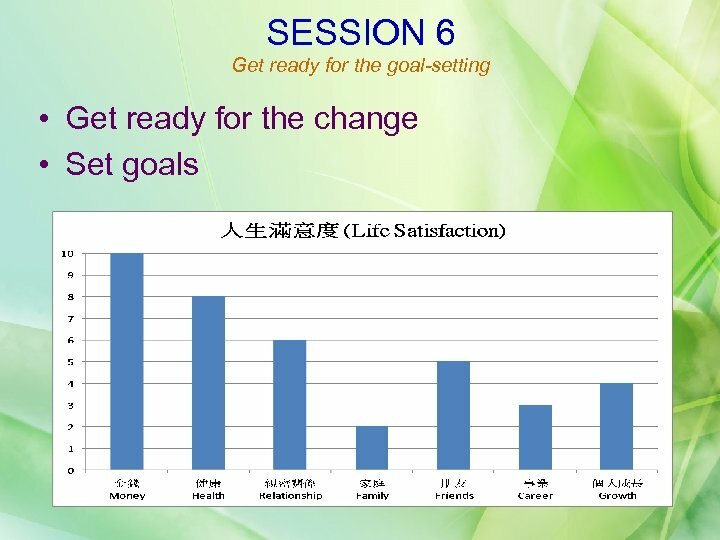 Declaration We realize the road for stop gambling is a long way to go, we will experience various difficulties and challenges even though, we will insist to quit gambling and never say no! 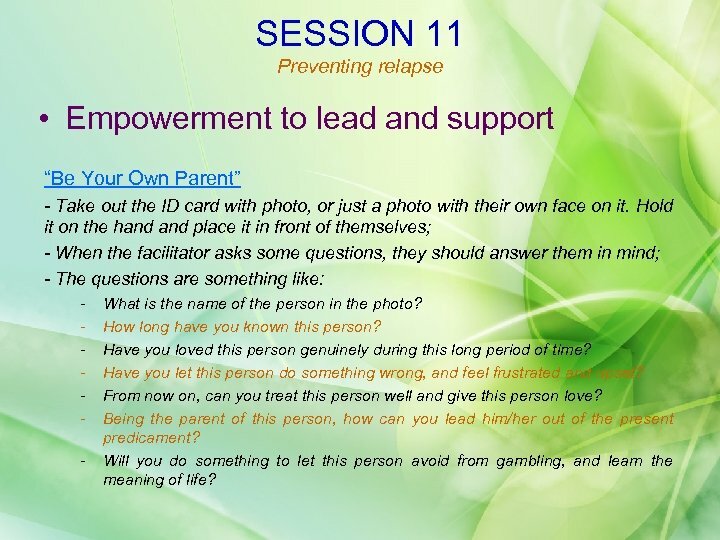 SESSION 11 Preventing relapse • Empowerment to lead and support “Be Your Own Parent” - Take out the ID card with photo, or just a photo with their own face on it. 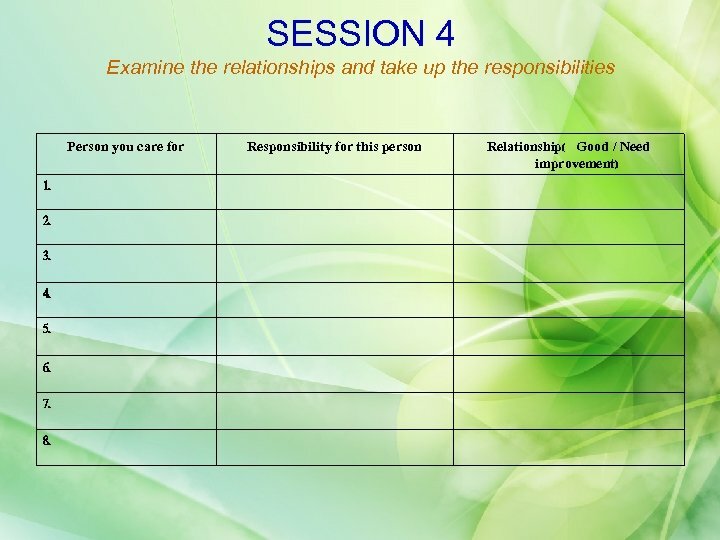 Hold it on the hand place it in front of themselves; - When the facilitator asks some questions, they should answer them in mind; - The questions are something like: - What is the name of the person in the photo? How long have you known this person? Have you loved this person genuinely during this long period of time? Have you let this person do something wrong, and feel frustrated and upset? From now on, can you treat this person well and give this person love? Being the parent of this person, how can you lead him/her out of the present predicament? 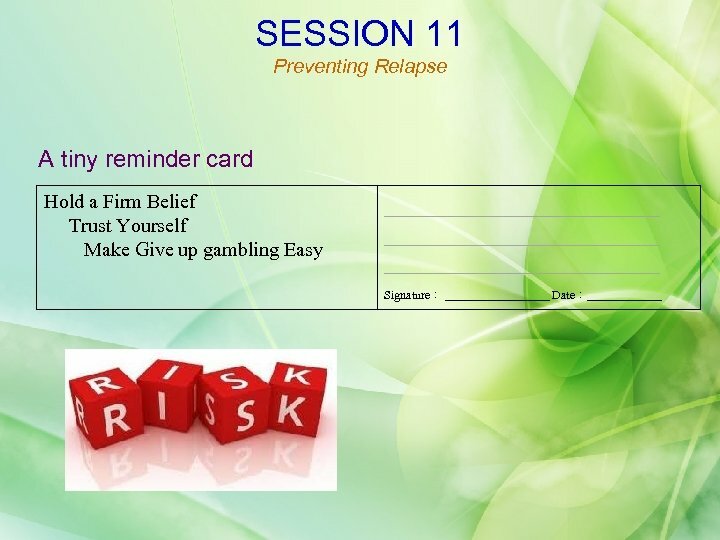 Will you do something to let this person avoid from gambling, and learn the meaning of life? 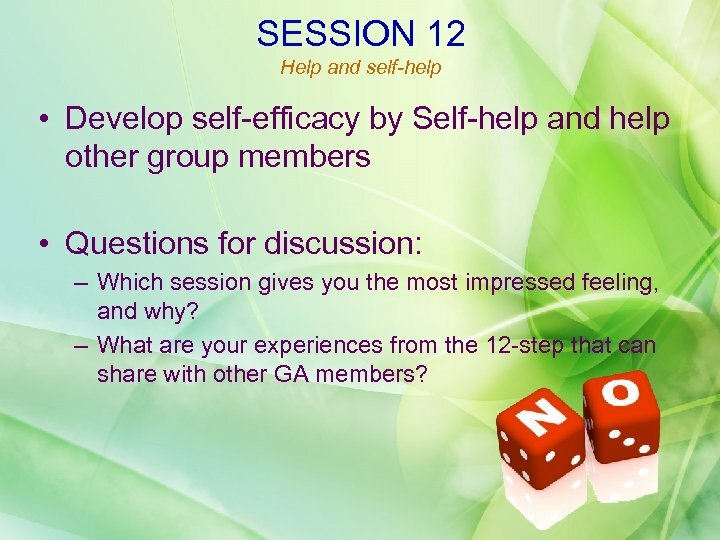 SESSION 12 Help and self-help • Develop self-efficacy by Self-help and help other group members • Questions for discussion: – Which session gives you the most impressed feeling, and why? 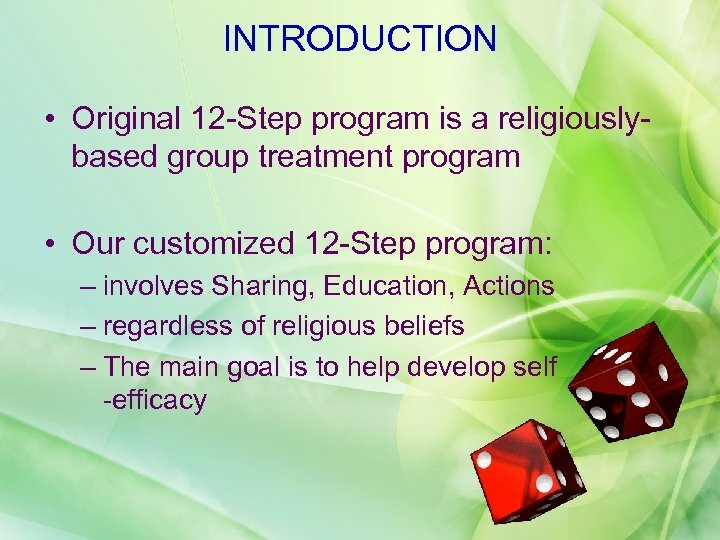 – What are your experiences from the 12 -step that can share with other GA members? REFERENCE Ferris, J. 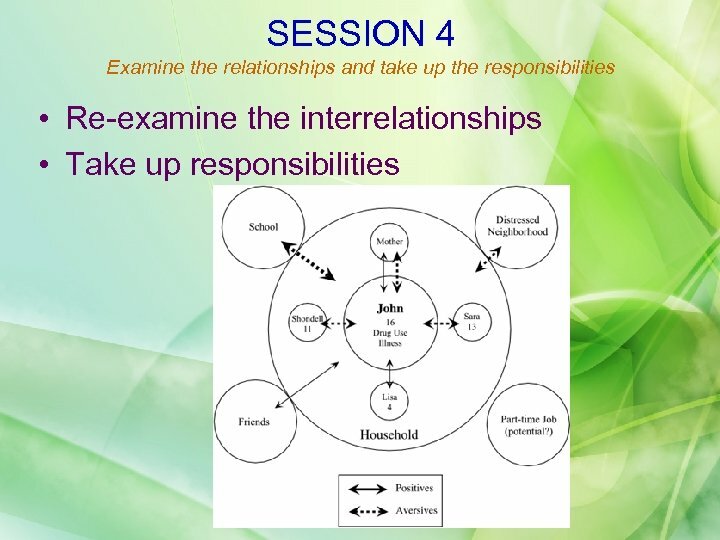 & Wynne, H. (2001). 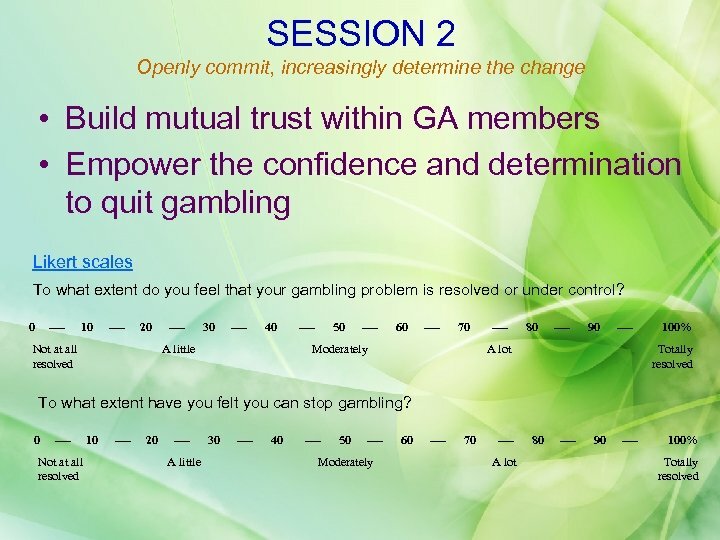 The Canadian Problem Gambling Index Questionnaire. 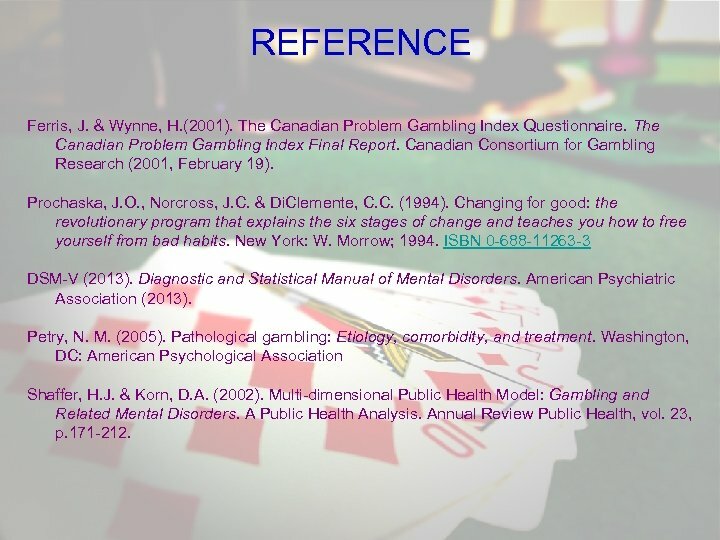 The Canadian Problem Gambling Index Final Report. 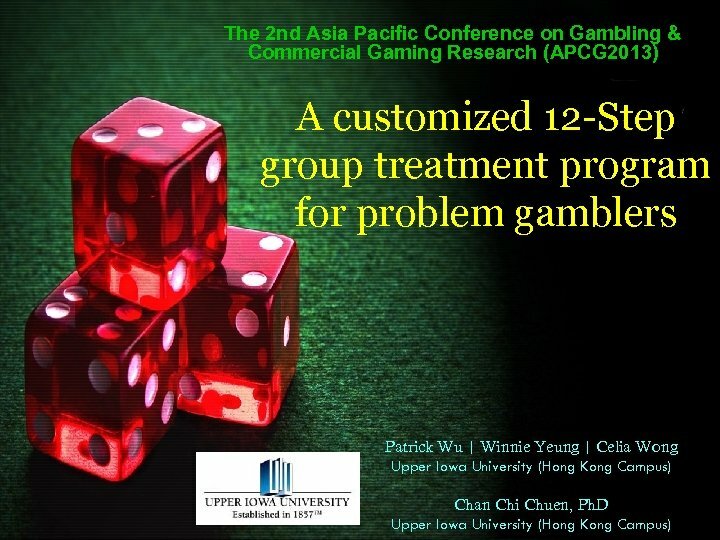 Canadian Consortium for Gambling Research (2001, February 19). Prochaska, J. O. , Norcross, J. C. & Di. Clemente, C. C. (1994). 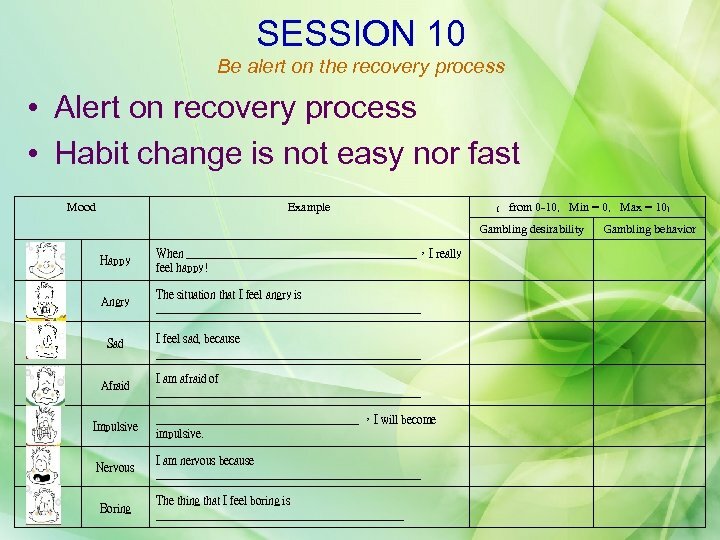 Changing for good: the revolutionary program that explains the six stages of change and teaches you how to free yourself from bad habits. New York: W. Morrow; 1994. ISBN 0 -688 -11263 -3 DSM-V (2013). Diagnostic and Statistical Manual of Mental Disorders. American Psychiatric Association (2013). Petry, N. M. (2005). Pathological gambling: Etiology, comorbidity, and treatment. Washington, DC: American Psychological Association Shaffer, H. J. & Korn, D. A. (2002). 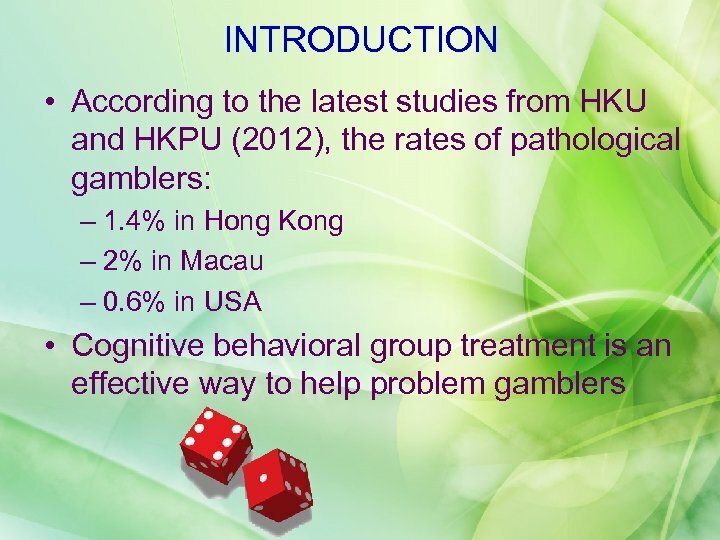 Multi-dimensional Public Health Model: Gambling and Related Mental Disorders. A Public Health Analysis. Annual Review Public Health, vol. 23, p. 171 -212.